In November of 2013, PRISM was contacted by a homeowner in Council Bluffs, IA for assistance with their home. The activity seemed to slow a bit and the homeowner decided against any sort of an invesitgation. In August of 2014, the homeowner contacted PRISM again for assistance. September 13th, 2014, PRISM conducted a Pre-Investigation at the residence. The homeowners were experiencing shadows, voices, singing, doors opening and closing, out of body dreams, and most recently scratches. During the Pre-Investigation, PRISM deemed it necessary to conduct a full investigation at the location. On November 8th, 2014, PRISM investigators, Kelley, Bo, Michael, Cassie, Nichole, Matt, John and Carrie investigated again at the Council Bluffs residence. During the evening, the team members and the homeowners all experience unexplained activity. Here are some of our findings from our 11/8/2014 paranormal investigation of the Council Bluffs, Iowa residence. This video is a compilation of banging and snapping noises captured throughout the evening. The noises were only ever captured when an investigator was in the room. This EVP was captured in the girls room at approx. 10:25PM. Prism Investigators, John, Michael, Bo and Matt along with the homeowner were all in the room at the time. The EVP captured sounds like a female or a childs voice saying "John". All of the females were in the basement at this time. This EVP was captured in the girls room at approx. 10:00PM. There is no one in the room at the time this was captured. PRISM investigators are discussing a plan for the next part of the investigation in the attached living room. It sounds as though someone says "Do This" in response to our conversation. This EVP was captured in the girls room at approx. 10:40PM. All of the PRISM Investigators along with the Homeowner's are all in this room at the time. In this recording, you can hear Prism Investigator, Carrie ask, "Do you want us out of here?" and a response can be heard. This EVP was captured in the infants room at approx. 11:20PM. The PX Ghost Box says the word Memories. At which time the homeowner asks how many memories are in this room? We seem to have captured something saying Three and then something else that is inaudible. This EVP was captured in the girls room at approx. 10:00PM. There is no one in the room at the time this was captured. The EVP sounds like 2 different voices. This EVP was captured in the girls room at approx. 12:55AM. There is no one in the room at the time nor did the recorder located in the laundry room or any other room of the house capture this recording. In this 2 part audio clip, it sounds as though a child is talking and then crying. There were no children present during any part of this investigation. This EVP was captured in the infants room at approx. 12AM. The homeowners and PRISM Investigator Bo were seated on the basement stairs. The homeowner talks about lighting up the K2, which at the time was lighting up on command. You hear the homeowner ask for the spirit to go to one of the red lights around the house and say its name. The audio recorder in the basement where they are seated doesn't pick up this voice. There is no one present in the infants room at this time. 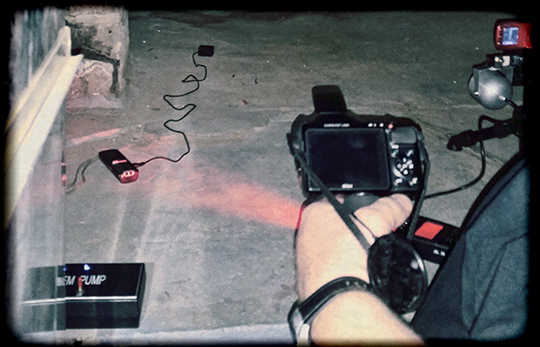 This EVP was captured in the laundry room at approx. 12AM. At this time, the PRISM Team is using holy water in an attempt to trigger spirit activity. There is no one in room at the time, we have captured what sounds like a person saying no in the distance.